The leaves on the trees are changing to fall colors. Yesterday we were watching the first storm of the season strip away the bark from the Eucalyptus trees in our front yard to reveal intense yellows, browns and green colored trunks. 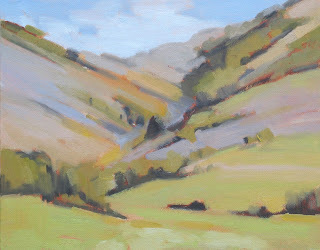 The landscape surrounding Stanford is rolling hills and open space with ever changing colors. As we're approaching winter, the golden hills are beginning to turn green. On my palette, I have seven basic colors of paint, plus white. 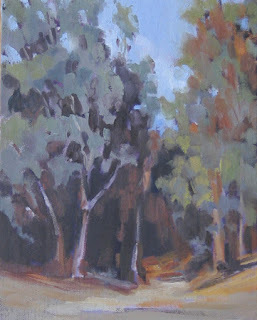 As I was creating this painting I was amazed at the subtle variations created from these eight colors of paint. 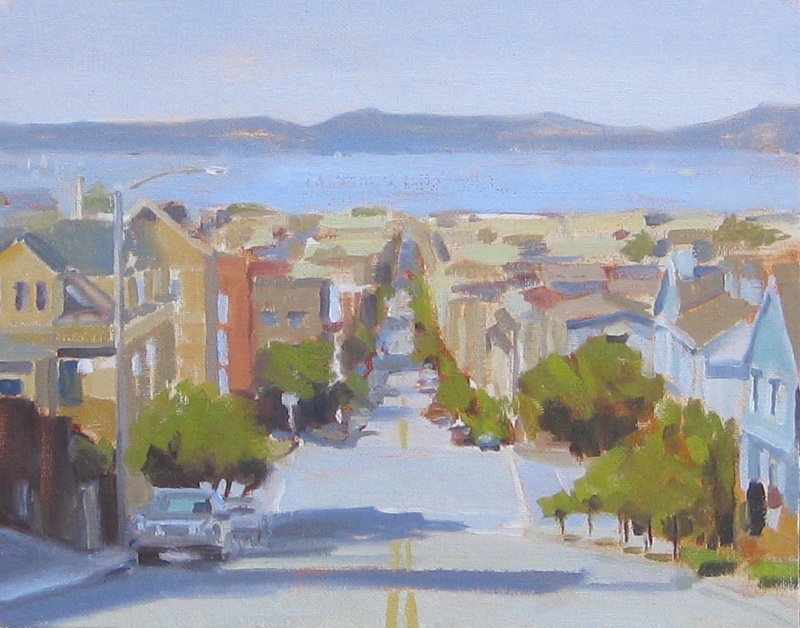 Pacific Heights is located in one of the most scenic settings in Northern California with spectacular views of the San Francisco Bay, Golden Gate Bridge and the Presidio. It's an affluent neighborhood characterized by painted Victorians and mansions that were largely built after the 1906 earthquake. I captured this view on one of those perfect afternoons when the Golden Gate was free of fog and the Marin headlands seemed so close across a glistening bay. I'm sure it was days like this that made Pacific Heights attractive to the builders of these beautiful houses. 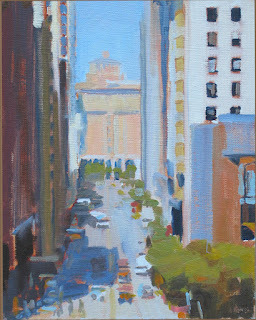 I've always liked to paint architecture. 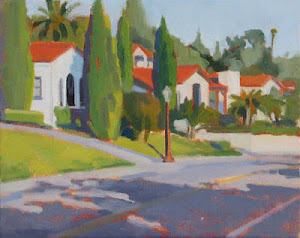 Josef Woodard of the LA Times described my paintings of Ventura as "townscapes." 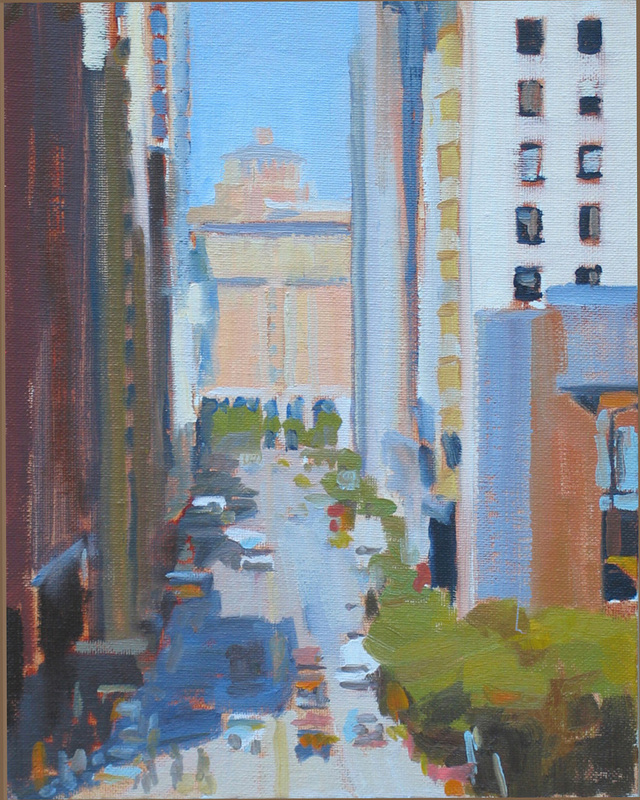 Following in that tradition, I've painted a cityscape of San Francisco, looking down Market Street at the Ferry Building on the Embarcadero. I'm attracted to the shapes and colors in architecture and the abstract juxtapositions. I like the long shadows that tall buildings cast in the city. With buildings of different heights, the sun can peek through in different areas.